For the Muse Challenge where Ardyth is the Muse this week, I used the same color theme, similar flowers and stems and some glitter on the petals. For the MFT Summer School Challenge I chose blue (gallon), green (quart) and yellow (pint). I chose "birthday wishes" as the sentiment, although other sentiments, such as get well, thinking of you, etc., would work well. I like the look of tilting the panel just a touch. Thank you for looking and commenting ... greatly appreciate your feedback. 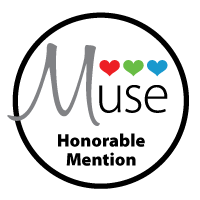 This card was selected as an Honorable Mention at Muse (07-21-15). Thank you for your votes. Love the subtle patterns in your colour blocks - they give a whimsical look to your card! So glad you joined me at Muse this week! Love your flowers...what a pretty card! This is so pretty!! I love the delicate flowers you used and the big blocks of color. Great design! Love your trio of daisies! Great take on the Muse card - the flowers really pop!